. “Heart and Soul” a Spectrum of possibilities Event will feature their students work. 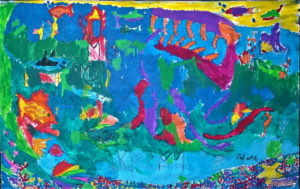 Come and meet the artist and instructors Friday, April, 6th from 6:00 to 8:00 in the evening. A presentation about these wonderful programs will begin at 7:00 pm. First Friday is a wonderful time for you to enjoy an evening of Art, Music, and Refreshments, this event is free and open to the public. I hope that you will show your support to these amazing artists. Please visit the events page for more details. Artisans’ Corner Gallery features local art handcrafted by local artisans, with a wide variety of art and gifts. Each First Friday we focus on a particular artist, this month, however, we are hosting this special event with Amy and Carol along with their students. This unique event goes even one step further in that one of the featured artists will be celebrating his birthday that day. What could make a better birthday present that coming to the art show and supporting these amazing artists?